Effective strategies for building a thriving urgent care business from concept to clinical care to operations and expansion. For both new and existing urgent care centers, the increased competition for patients’ hearts and wallets means that ongoing strategic planning is critical—there is little room for error. For those potential new sites as well as growing concerns, a savvy understanding of the market realities and a book full of insights, cautions, and aggressive suggestions are just what the doctor ordered. 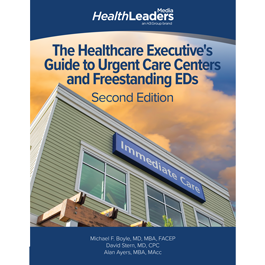 The Healthcare Executive's Guide to Urgent Care Centers and Freestanding EDs, Second Edition provides healthcare executives, enterprising physicians, and operations/financial leaders the insights and practical tools they need to create a successful urgent care center. The different types of urgent care facilities, including retail clinics, moderate-and high-level urgent care, and freestanding EDs, along with indications for the development of each. The business structure of urgent care, including private corporations, hospital affiliation, ACOs, and multi-state corporations. A step-by-step analysis of the urgent care business plan development process, urgent care site section, and organizational development. Various staffing requirements based on the intent of the urgent care site, and a focus on personnel, including staffing mix, contracts, and both clinical and facility leadership. Basic marketing plans and patient satisfaction methods to promote growth and volume for the site. The role of telemedicine: allowing consumer-patients to access care anywhere, at any time. The competitive advantages and methods used to offer expanded services, including occupational medicine, wound care, immunization, wellness, and other programs. Michael F. Boyle, MD, MBA, FACEP, has spent more than 25 years practicing emergency medicine and managing emergency departments, fast track programs, occupational medicine programs, and urgent care centers. He is the Vice President and Regional Medical Officer for Schumacher Clinical Partners for sites in New York and Pennsylvania. Dr. Boyle has traveled extensively providing consultation for emergency department management, hospital-wide flow improvement, urgent care program development, and patient satisfaction. His primary focus is hospital-affiliated programs for emergency services, occupational medicine, and urgent care. Over the past several years, he has lectured around the country for the UCAOA and others reviewing various urgent care and population health topics. Dr. Boyle received his degree from Eastern Virginia Medical School in Norfolk, Virginia, and completed his emergency medicine residency at Wright State University of Medicine in Dayton, Ohio. He obtained an MBA with healthcare focus through the University of Phoenix in 2012 while authoring the initial edition of this text, and has published several book chapters and articles over the last decade. David Stern, MD, CPC, has worked for over 28 years in the urgent care industry. Dr. Stern began his career as a provider and later as a partner in the Physicians Immediate Care group, which operated 20 urgent care centers in the Midwest. Dr. Stern currently serves as CEO of Practice Velocity, offering the PVM practice management software system and the VelociDoc Electronic Medical Records (EMR), which received the Best in KLAS Award for Category Leader for seven consecutive years since 2013. Dr. Stern has served on the board of directors for multiple urgent care, private equity, and IT companies. He has been involved in the ownership structure of more than 80 urgent care centers in ten different states. Dr. Stern served on the founding Board of Directors of the Urgent Care Association of America and has received its Lifetime Membership Award. Dr. Stern is the proud father of five children, and he and his wife reside in Rockford, Illinois. Alan A. Ayers, MBA, MAcc has over 12 years’ experience in strategic planning, business development, clinical operations, sales/marketing and customer service for urgent care, occupational medicine, and primary care facilities of all sizes. He’s been recognized as one of the nation’s 15 Urgent Care Influencers and currently serves as Vice President of Strategic Initiatives for Practice Velocity, LLC. In addition, serving as a C-level executive for the urgent care divisions of two leading health systems, for eight years in various executive roles at Concentra, he implemented and grew services in over 300 mixed-model locations. A prolific and award-winning writer, Ayers is practice management editor for The Journal of Urgent Care Medicine (JUCM), and has contributed over 450 original pieces on urgent care-related subjects. He has also served as a Board Director and Advisor to the Urgent Care Association of America (UCAOA). Prior to his work in urgent care, Ayers consulted with national retailers like Walmart, McDonalds, Bank of America, and Verizon Wireless.